Cenovus Energy says amphibious vehicles offer game-changing way to restore land - Great Excavations Inc.
November 2016 – It’s wet, muddy and difficult to reach. Much of the land in northern Alberta is muskeg, meaning it has a swamp-like consistency. That creates challenges for restoring land near our oil sands operations. Working in this region often requires creative approaches because our machinery can get stuck in the boggy terrain. That’s where amphibious vehicles come in. 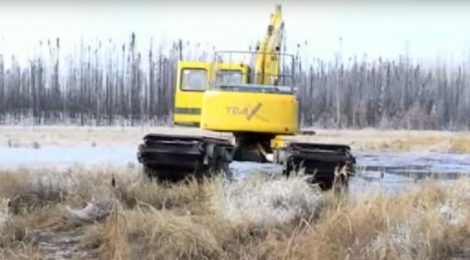 Using machines that can drive on land and float on water is a first for restoration in the oil sands. Before using amphibious vehicles, we were limited to doing land restoration work in January and February. The heavy excavators that traditionally do this work can only operate when the ground is frozen. “We’re very excited that we can now do restoration work throughout most of the year,” says Ted Johnson, Cenovus Group Lead, Land & Biodiversity. “These vehicles are a likely game-changer because we can conduct restoration work in any season, at a faster pace, potentially at a lower cost and with minimal environmental impact. This project builds on an earlier pilot test which was an example of industry collaboration. Cenovus worked through Canada’s Oil Sands Innovation Alliance (COSIA) to test the vehicles with Devon and ConocoPhillips. In tests conducted in 2015, we found the vehicles were better able to do restoration work on soft soil and cross a creek without causing as much damage or stirring up sediment in the water. The tests also showed that amphibious vehicles can restore more than two times the area of land per day compared to standard machines. “Some of the restoration work we’re completing using these amphibious vehicles includes mounding the ground to make high, dry areas for seedlings to take root and bending tree stems,” says Ted. “This makes it harder for caribou predators like wolves to navigate old seismic lines.